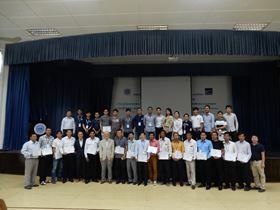 Eighty three people attended Ebara Corp’s pump technology seminar at the Institute of Technology of Cambodia (ITC) in Phnom Penh, Cambodia 28–29 June 2018. The Ebara lectures focused on pump basics and pumping stations used for water supply facilities. The Japanese pump company has held more than 20 seminars in Cambodia. Agriculture is the main industry in Cambodia and many pumps are used for irrigation. In addition, demand for water supply and sewerage pumps in Cambodia is increasing with urbanization. The technical seminars took place 22–23 March 2018 at the Vietnam-Japan Institute for Human Resources Development (VJCC) in Ho Chi Minh City.